Happy Monday! I took a trip back to good old Illinois this last weekend and believe it or not, it was a beautiful 84 degrees on Saturday and today it is snowing. How’s that for a change in weather! It seems every time I go back it has snowed on me. I thought surely in April I will be safe from the snow…..but it got me again. As they say ~ the only good thing about a spring snow is you know it will all be melted soon ~ indeed they are already forecasting warmer temperatures for later in the week. 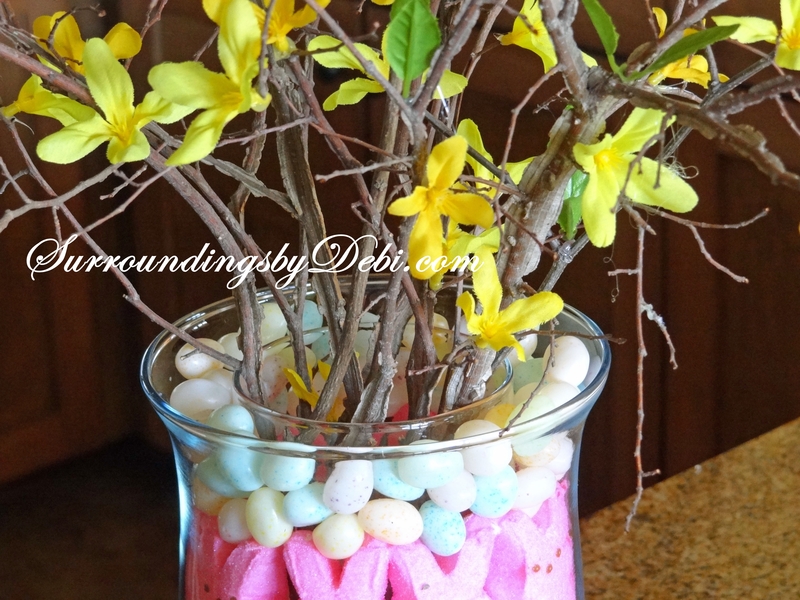 So with the hope of sunshine for Easter, I thought I would do a quick and easy Easter vase arrangement. I had promised to show you how the vase was created that my daughter and I had used on the Easter table we had decorated a couple of years ago. You can find it HERE. It is really so simple. 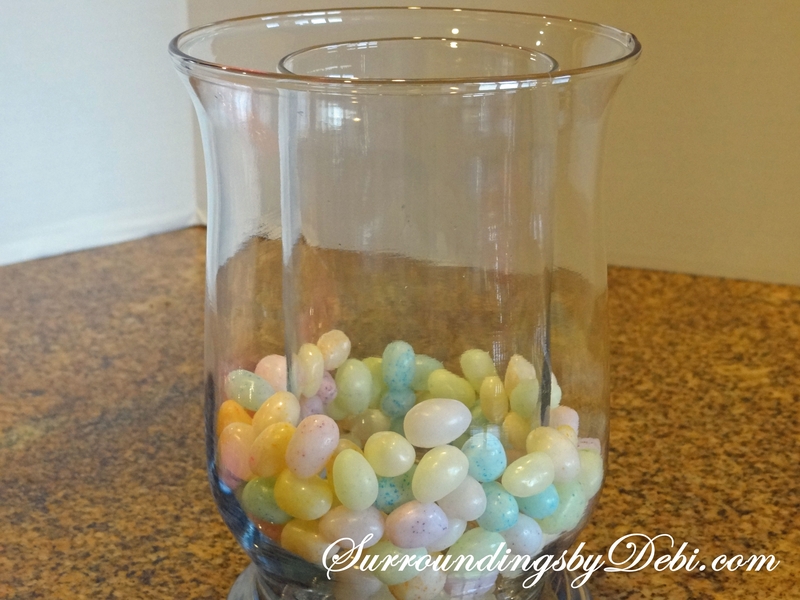 This time I am making the vase using Jelly Beans. A large vase and another smaller one that will sit down in the first vase with about a half inch to spare around the inside. I think I purchased mine at Hobby Lobby or some place similar. 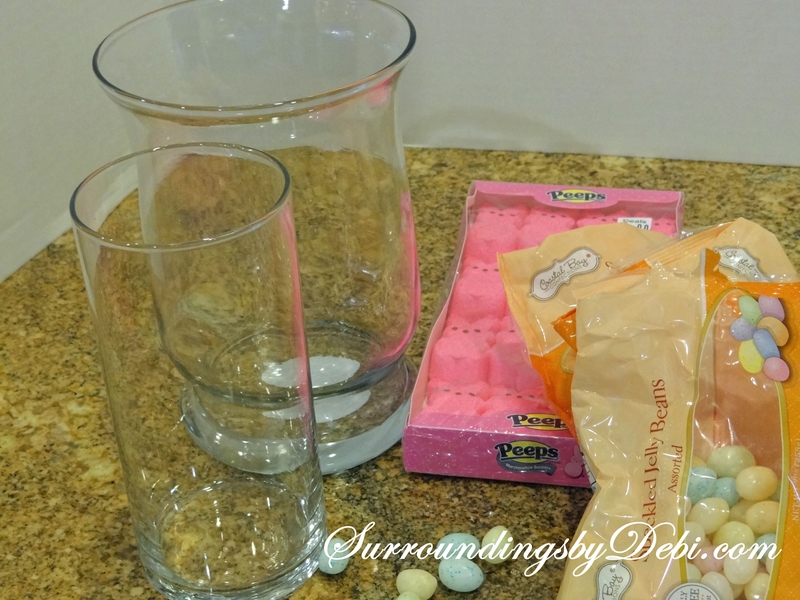 You can find them at nearly any discount or craft store. A couple of bags of jelly beans. Well I didn’t actually use two bags – as you can see I had already had a few of them myself – and there may have been a few of the peeps gone as well. 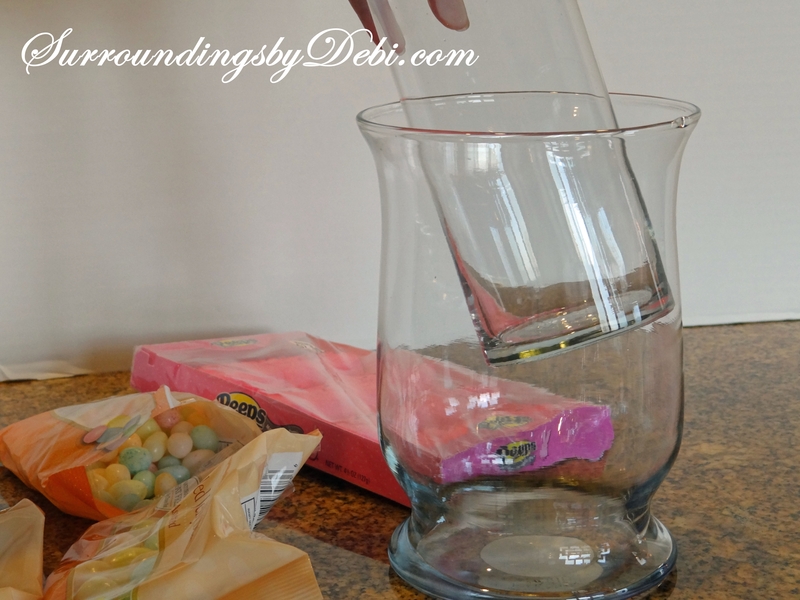 First insert your smaller vase inside the larger vase. Pour a portion of the jelly beans in the space between the vases. 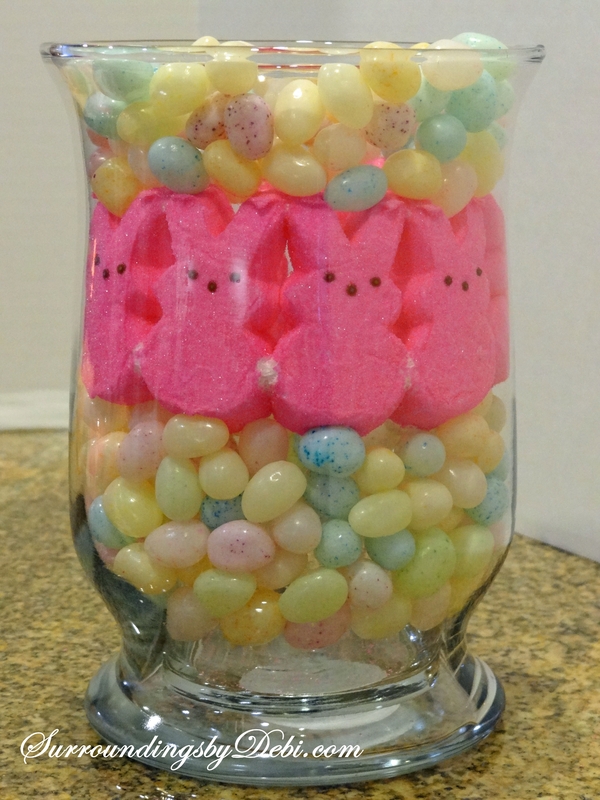 Next insert the “Peeps” right on top of the first layer of jelly beans. 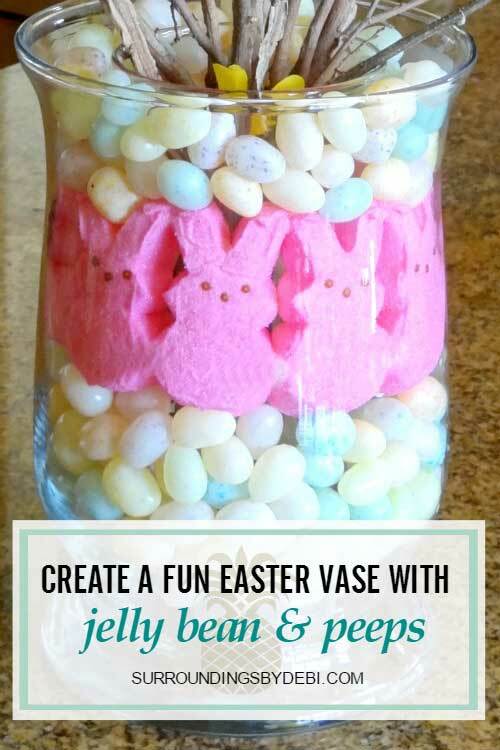 Top it off with another layer of Jelly Beans. Once that is done you can fill the inner vase with fresh flowers, artificial flowers or very simple branches as I have done here. 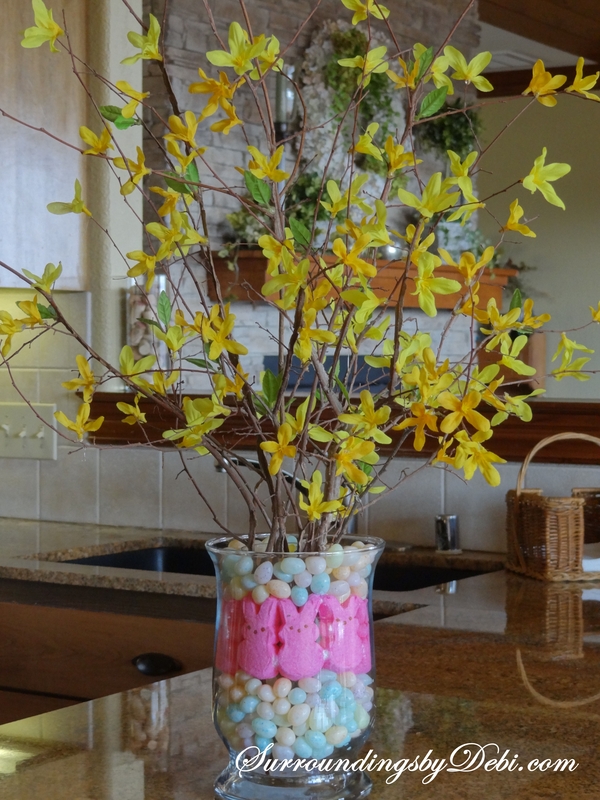 I used some forsythia branches that I had created out of scraps left over from the forsythia wreath I had created HERE. If you have little ones, this is a great project they would love to help you with. 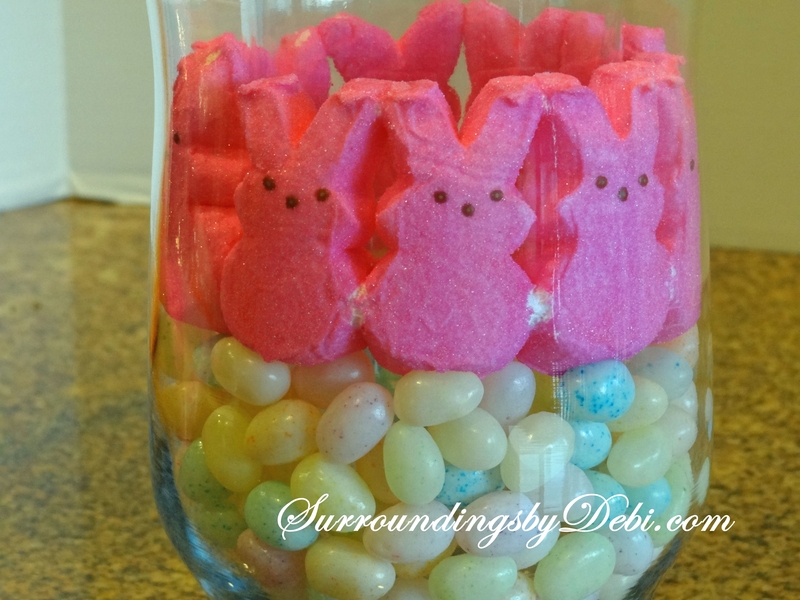 Super simple – super cute – super fun! 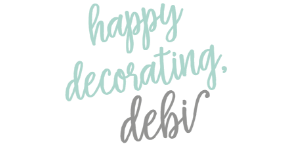 And if you don’t have little ones – then just let this project bring out the kid in you!